St. Patrick&apos;s Day is usually the time of year in Lehigh Valley where a glint of spring begins to shine down on the streets that just a few weeks ago were feet deep in snow. It&apos;s the first time in the new year focused on getting outside and celebrating with friends and family without the protective gear you&apos;d see on at Ski Blue Mountain. Thankfully, Lehigh Valley is home to not one, but two great St. Patrick&apos;s Day city celebrations in for the form of the 58th Allentown St. Patrick&apos;s Day Parade and the 5th Celtic Classic Parade of the Shamrocks in downtown Bethlehem. If you&apos;re like us, you&apos;re going to attend both, but if you have to decide, we&apos;ll give you a breakdown on both as well as a few other events going on throughout the area. As always, check our online calendar for all events. You can even upload your own by visiting UploadYourEvent.com. Or, please be sure to share your event in the comments section below. The Bethlehem Parade of the Shamrocks kicks off at 1 p.m. on Saturday, March 14. The parade route originates near 12th Avenue and heads down Broad Street before taking a turn onto Main and ultimately ending near the Historic Hotel Bethlehem. There really aren&apos;t any bad spots to watch the parade, but the one that gets the most performances and attention is the corner of Broad and Main, right outside of Bethlehem Brew Works. 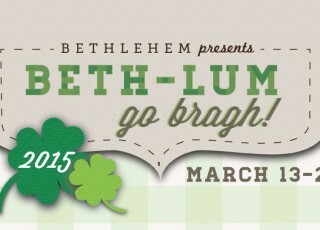 The Bethlehem Downtown Business Association has St. Patrick&apos;s Day activities throughout most of the month, including a brand new Bethlehem Go Braugh Photo Scavenger Hunt where you and your friends only need to snap some pictures to win prizes! Before you start watching the parade, however, be sure to visit Donegal Square at 534 Main Street for some perennial favorite events such as Best Legs in a Kilt contest at 11 a.m. on March 14 and the Celtic Doggie Day Parade on March 15 at 1 p.m.
Allentown&apos;s famous St. Patrick&apos;s Day Parade is one of the most iconic on the East Coast, featuring a myriad number of organizations, groups, businesses, sports teams, and high school and college students in the city&apos;s West End on March 22 at 1:30 p.m. Then be sure to continue to visit Allentown Brew Works for their week of St. Patrick&apos;s Day activities. And, to burn off some of those calories, Cheer your friends on during the St. Pat&apos;s 5K, kicking off just a few hours before the parade. As far as watching the parade, there&apos;s really no poor vantage point during the Allentown St. Patrick&apos;s Day parade. The crowds are deep, the families are having a great time, and the local restaurants and pubs are overflowing with good cheer. 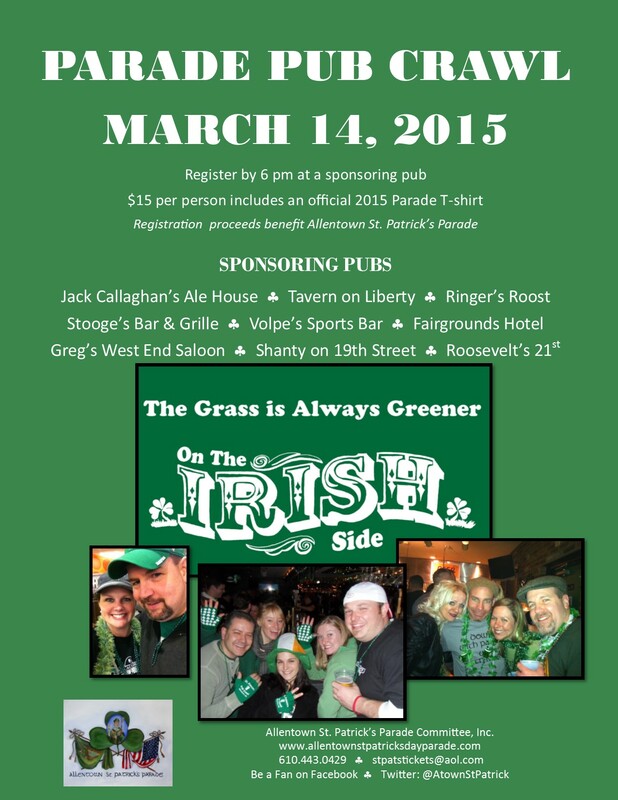 A week before the parade, be sure to kick off the St. Patrick&apos;s Day in Allentown on March 14 with the West End Pub Crawl, featuring some of the best bars, green beer, and whiskey in town. The Allentown Brew Works Cask Beer Festival is also taking place on the 14th, making for one of the best beer sampling days of the year. No matter what you decide to do to celebrate St. Patrick&apos;s Day, as always, be careful, safe, and have a great time! We&apos;ll see you there!